Zimbabwe shutdown protests (file photo). Pro-democracy groups called on Zimbabweans in the diaspora to stage protests at the country's embassies after the Harare regime shut down the internet as it launched a crackdown against civilians. Harare, Bulawayo and most towns and cities were deserted Tuesday, the second day of countrywide protests called by the Zimbabwe Congress of Trade Unions (ZCTU) and backed by the opposition and anti-government groups. Five people were killed in Monday's unrest while dozens were injured, according to the Zimbabwe Association of Doctors for Human Rights. A government minister admitted that there had been fatalities, but he did not reveal numbers of the dead. 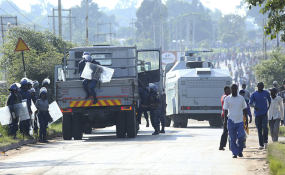 The start of the so-called shut-down on Monday was characterised by violence in Harare and Bulawayo with youths blocking roads, forcing kombis to stop ferrying people into the city centres and burning tyres on the roads. Human rights groups reported that the security services then responded with a midnight crack-down targeting civilians in the high-density suburbs. According to the Zimbabwe Lawyers for Human Rights (ZLHR), uniformed soldiers and police officers randomly carried out door-to-door raids in Harare's Mabvuku area, forcing entry into people's homes by breaking down doors and windows. "As at 0200 hours, on 15 January 2019, ZLHR continued to receive further reports that this illegal operation was still ongoing," ZNHR said in a statement. On Tuesday morning the streets of central Harare were deserted, and the shops closed with the police and soldiers telling people who had dared to venture into the city centre to go home. The mobile phone network and internet were jammed restricting access to social media platforms such as Twitter, Facebook and WhatsApp which been used by activists to rally support for the protests as well as expose the security services crackdown. "The blocking of social media sites by the Zimbabwe government show how delusional they are and their misplaced faith in the command politics of the 19th and 20th Century," said losing presidential candidate Noah Manyika. UK-based political commentator Alex Magaisa added; "The State can do a lot of bad things to citizens without the outside world getting a full picture as things happen. "Back in August 2018 & yesterday, it was easier to follow events as they happened due to the glare of the media and social media. Now it's dark & secretive." The internet blockade continued into early Tuesday evening, prompting calls for protests at Zimbabwe's embassies abroad to raise international attention over the crackdown. Said Pedzisai Ruhanya of the Zimbabwe Democracy Institute on Twitter; "We people in the diaspora must start to organize ourselves and protest at Zim embassies across the world against internet shutdown and security forces abuses in Zim. "We must organize not agonize. Those in Davos start mobilizing!" Human rights lawyer Doug Coltart added; "There is a total internet shutdown in Zimbabwe. VPNs are not working. All websites are down. The techie gurus got me back on for few minutes to get this message out: Zimbabweans in the diaspora and our friends throughout the world, please keep up the campaign to #SwitchBackOnZw!" The protests were triggered by government's weekend decision to increase fuel prices. The hike was announced by President Emmerson Mnangagwa before he left for Russia on a three-day state visit.